Windows 10 usage has increased since Microsoft began serving the operating system as an automatic upgrade to PCs running Windows 7 or Windows 8.1, according to an analysis of data from two metrics sources. But the growth in Windows 10's usage share so far this month has been significantly less than late last year, when it soared, probably due to new PCs bought around the holidays and the increased use of Windows 10-powered devices when people were not at work. Two weeks ago, Microsoft confirmed that it was pushing the Windows 10 upgrade to customers running the older editions, saying at the time that the automatically-delivered bits were being rolled out in a "phased approach." Although Microsoft declined to answer questions about how the upgrade was being presented to users, most analysts and pundits expected the maneuver to result in a major boost to Windows 10's usage share. That share has climbed, but not a rate that Computerworld would characterize as either major or significant. According to Irish analytics vendor StatCounter, Windows 10's global share of all operating systems posted week-over-week gains of around four-tenths of a percentage point in the first week of February, but declined after that. From Feb. 8 on -- when the seven-day averages included only dates after Microsoft began serving the automatic upgrade -- usage share increases averaged just three-tenths of a percentage point. That was far under the eight-tenths-of-a-point gains recorded by Windows 10 on the last two days of 2015. 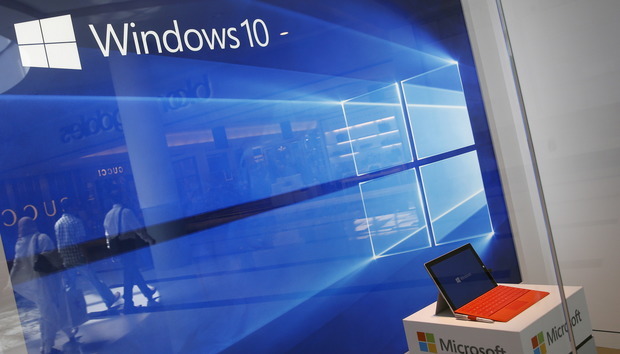 Another source -- the U.S. government's Digital Analytics Program (DAP) -- also signaled an increase of the OS's share after Microsoft began positioning the Windows 10 upgrade on customers' PCs. DAP collects and collates visits to more than 4,000 websites on more than 400 different domains maintained by U.S. government agencies, including some, like the U.S. Citizenship and Immigration Services (USCIS), that attract non-U.S. residents. The bulk of the traffic DAP measures, however, is domestic. By DAP's data, Windows 10's share of all Windows devices -- and thus a different metric than StatCounter's, which was of all personal computers, not just those running Windows -- jumped from a week-over-week average gain of just three-tenths of a point on Feb. 8 (the first date that included only those dates subsequent to Microsoft's announcement) to seven- and eight-tenths of a point on Monday and Tuesday, respectively. DAP's measurement of Windows 10 growth this month, however, was, like StatCounter's, paltry compared to the end of 2015, when average gains hovered around the 3-point mark, four or more times that of more recently. In fact, the small increases in usage this month -- based on the data from both StatCounter and DAP -- were indistinguishable from the other periods of growth that Windows 10 has experienced since its July debut. It's unclear, then, if the latest gains were due to the appearance of the Windows 10 upgrade on older PCs, or attributable to the operating system's organic ups and downs. There are several possible reasons for the lack of usage share increases by Windows 10 since the beginning of the month. Microsoft could be serving the upgrade to a small number of Windows 7 and Windows 8.1 PCs as it takes its "phased" approach; users might be rejecting the upgrade offer; or if they do install Windows 10, they may be taking advantage of the month-long opportunity to roll back to their previous version of Windows. Thus far, the only certainty is that the upgrade offer through Windows Update hasn't substantially moved the Windows 10 needle. Computerworld will regularly revisit the data from analytics firms to determine if there is outside evidence of the strategy's success. Preliminary data shows that Microsoft's effort to get Windows 7 and 8.1 customers onto Windows 10 by offering the upgrade through Windows Update was accompanied by small gains in usage share. However, that growth was similar to, or even less than, other periods of Windows 10 usage increase.